Low Countries, Flanders. Louis De Male, AD 1346 to 1384. Silver double Gros. LARGE FLAN. Denomination : Silver double Gros (or Plak or Botdrager). Date : This type was struck ca. AD 1377 to 1380. Size : 32.0 x 32.6 mm. Weight : 3.96 grams. Reference : G-224. Thompson 3797. Grade : VF. Struck on a very large flan with only a few weak letters. 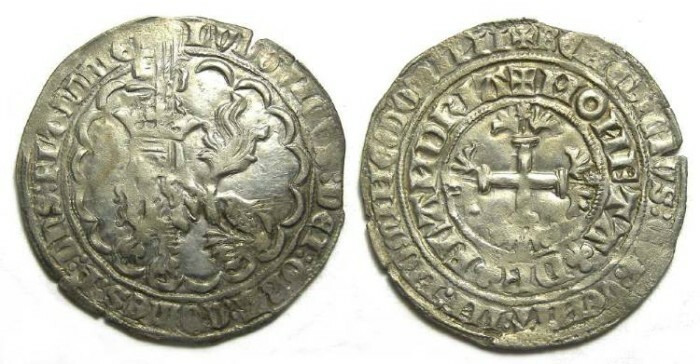 Obverse : Seated lion wearing an elaborate helmet, with LVDOVICVS DEI GRA COMES S DNS FLANDREI around. Reverse : Cross Fleuronne, with two rings of inscription around. The inner ring reads MONETA DE FLANDRIA. The outer ring reads BENEDICT QVI VENIT IN NOMINE DOMINI (some of the letters are written mirrored). Because of the large flan, the inscriptions are fully on the flan.